The computing times they are a-changing: the market is awash with tablets that double up as laptops and vice versa. But what are the relative merits of the devices in this new category? And are you better off sticking with a traditional laptop computer after all? 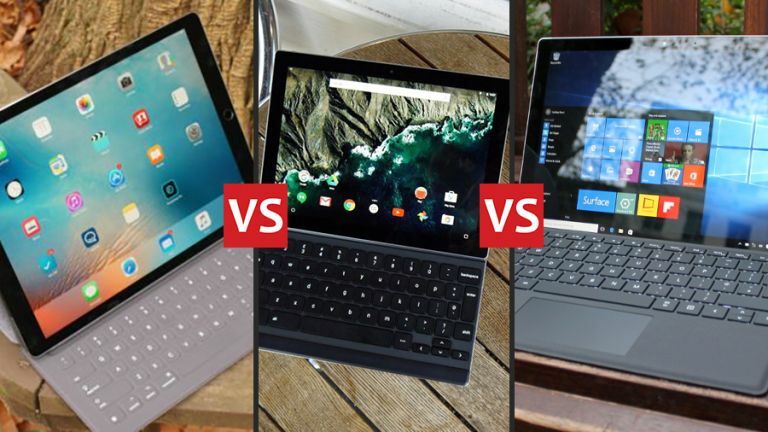 To help you pick your way through the various options on offer, we're pitting three of the top models up against each other: Apple's iPad Pro, Google's Pixel C and Microsoft's Surface Pro 4. Read on to find all the vital statistics, pros, cons and more besides. Design and hardware: Apple's biggest ever tablet boasts a gigantic 12.9-inch display running at a resolution of 2,732 x 2,048 pixels (264 pixels-per-inch). Its state-of-the-art components mean it's fast in operation - very fast - and it weighs in at 713-723 grams (1.57-1.59 pounds). The Cupertino company's usual excellent eye for design is in evidence here, but the clip-on, trackpad-less keyboard cover does spoil the streamlined aesthetic just a little. Software: You get iOS on the iPad Pro along with everything that entails - an excellent selection of apps, smooth and snappy performance (especially considering the powerful components under the hood) and unbeatable integration with other Apple products. Although iOS now supports a Split View mode, it's not ideal for multitasking and you don't get quite the same windowed flexibility as you do with OS X on a Mac or Windows. Design and hardware: The Pixel C is obviously designed as a direct iPad Pro rival, though it settles for a smaller 10.2-inch screen at a 2,560 x 1,800 pixel resolution (308 ppi) and as a result it weights a lighter 517 grams (1.14 pounds). There's enough internal grunt (including an Nvidia CPU) to provide a smooth computing experience. It may not be as well-rounded or as iconic as the tablet put out by Apple, but it's almost as appealing to look at. Software: The general consensus is that Android 6.0 Marshmallow is the Pixel C's biggest problem. Sure, Android may be just as good as iOS on a smartphone, but the OS isn't as well optimised for tablet use - and nor are the apps that run on it. There are no native windowed or genuine multitasking capabilities here (although Google is rumoured to be working on this), but the included apps (Gmail, Drive, Chrome) do make good use of the extra space. Design and hardware: Microsoft has been at the Surface game for quite some time now (since 2012 to be precise) and it shows in the pleasing design of the Surface Pro 4. This 12.3-inch, 2,736 x 1,824 pixel resolution (267 ppi) tablet really looks the part, and it's packed with laptop-level specs (as with a laptop, there are a choice of configurations and prices). At a weight of 766-786 grams (1.69-1.73 pounds) it's the heaviest 2-in-1 in our selection. Software: The Surface Pro 4's ace card is that it's running a full desktop operating system - Windows 10 - rather than a mobile OS such as iOS or Android. That means Photoshop, iTunes, Spotify, a full desktop web browsing experience, and so on. Of course you have to pay for the extra power needed to run such an OS, but in theory you can do just about everything you can do on a Windows laptop or desktop on a Surface Pro 4 tablet. Despite the substantial efforts of the hardware teams at Apple, Google and Microsoft, the best 2-in-1 for you is probably the one that runs the software you're already most comfortable with - namely iOS, Android or Windows. All of the tablets in our round-up are well designed and powerful, so the software operating system (and of course the apps running on top of it) are going to make a significant difference to the end experience. Take the OS completely out of the equation and the iPad Pro is probably best for creative types or entertainment lovers thanks to that huge screen. With its expansion ports (for a mouse, perhaps) and larger keyboard (complete with trackpad), the Surface Pro 4 is the most laptop-like and perhaps the best for productivity. That leaves the Pixel C of course - it doesn't really win in any category, but it is the cheapest of the 2-in-1s we've featured. Then there are the laptops that double up as tablets - the Microsoft Surface Book, Lenovo's Yoga series, a number of models from HP and Dell. If you value power more than portability (and want a proper keyboard at the same time) then consider these devices: they're laptops first but can also double up as tablets at a pinch - make sure you've weighed up the various pros and cons of these models as well before you part with your cash.